By far one of the best lounges inside of the Seattle-Tacoma International Airport (SEA) is the newly renovated Delta Sky Club. This lounge is massive with two floors of seating and a massive wall of windows that looks over the south side of the airport. Overall the Sky Club has some of the best food and views that I’ve experienced at the airport. Over the past couple of years Delta has been aggressively trying to take over the Seattle airport as a major hub to compete with Alaska Airlines. The airline already has made Seattle their Asian hub for flights overseas and is looking to expand but is waiting for the airport to expand their capacity. The lounge is located directly off of the main security checkpoint area within easy walking distance of all the central and south gates. The entrance is large and inviting into the lounge and directly through the door you’re greeted with the front desk. On the weekday around 8AM when I entered the lounge I only had to wait for one person before entering the lounge. Using my American Express Business Platinum card I gained access with it and my Delta ticket. 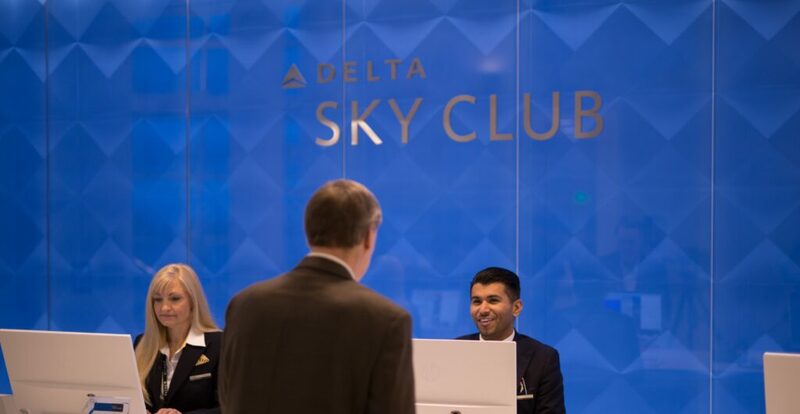 The Delta Sky Club requires that you have a valid same day ticket to enter the lounge and if you don’t hold a membership or valid class of ticket you won’t be getting in. The staff was very inviting when I walked up to the counter and the process to get checked in was simple, just showing them my Business Platinum card and my ticket. The check-in assistant was very nice and informed me on my gate and boarding time. I did appreciate that she gave me a recommended time to leave in order to make it to my gate on time. While I didn’t have the time to test it out, the lounge also offers showers for those who need to freshen up before or after your flights. 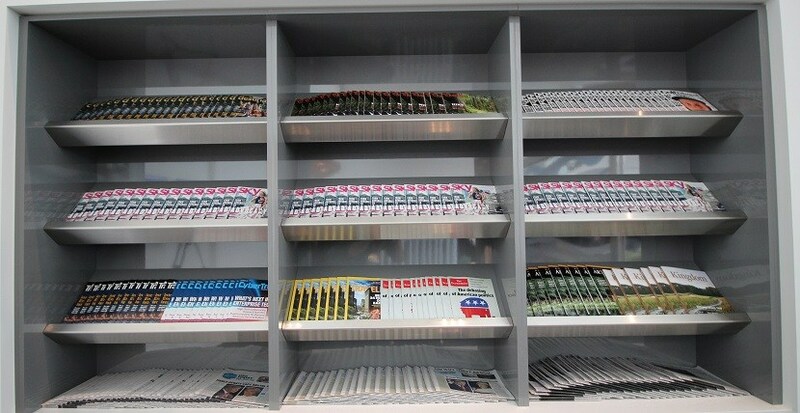 The lounge has no shortage of seats of all different kinds to get you comfortable before your flight. There’s lazy chairs, padded benches, and bar seating everywhere. You have two stories to pick from wherever you want to sit. At the time that I visited there was a lot of open seating available on both levels and I found a nice spot right next to the window with an awesome view of the planes outside. 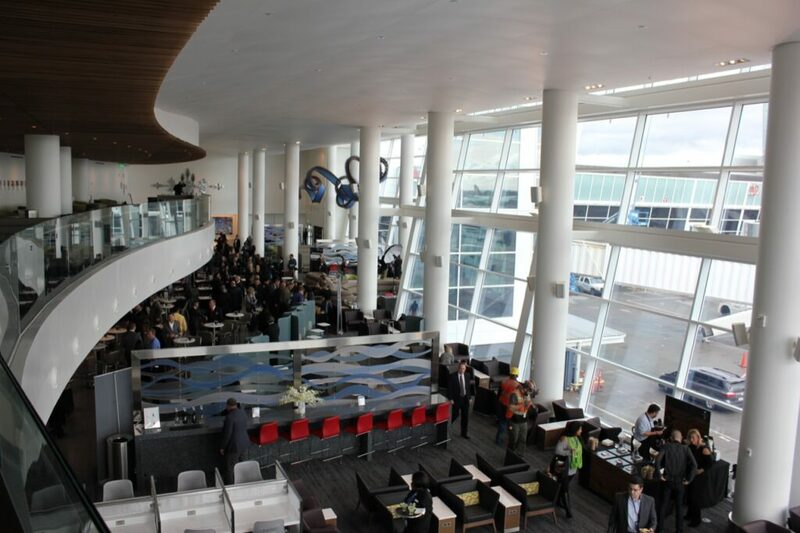 Not only is the Seattle Sky Club the biggest lounge in the airport but it also has some of the best food selection, even over the Centurion Lounge. For breakfast there was a large selection of both hot and cold foods including eggs, bacon, hash browns, oatmeal, fruit, and bread options. Bar staff were also on hand to offer a selection of alcoholic morning drinks, a full soft drink fountain, and lots of water and orange juice. 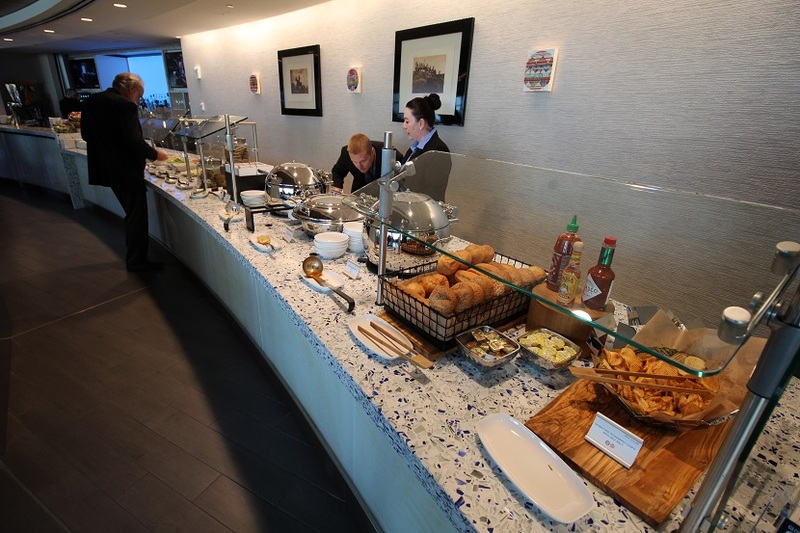 Throughout the day Delta Sky Club will offer a selection of hot items and a generous bar selection. Complimentary wi-fi was relatively fast and easy to connect to, there are signs around the lounge with wi-fi passwords to connect. It was sustainable to watch YouTube videos and browse around online while I was waiting for my flight. I was able to spend just about two hours in the lounge while waiting for my flight and between free drinks and browsing around I was able to pass the time. The Seattle Sky Club is without a doubt the best lounge in the Seattle airport. Being the largest lounge in Seattle it offers great views and a wide food selection. Being a large hub for Delta’s Asian routes it caters and gets busy around the international departure times. With the constant stream of hot food, free drinks, and fast complimentary wi-fi you can find a great place to relax up for your flight. I wasn’t able to visit it, but the Sky Club also offers a shower that is supposed to be pretty amazing. Their full shower facilities can be good to refresh yourself after a long flight or in between flights if you happen to have a layover. After visiting a majority of the domestic lounges inside of the airport I can hands down say that the Delta Sky Club is the best. The Seattle Sky Club is without a doubt the best lounge in the Seattle airport. Being the largest lounge in Seattle it offers great views and a wide food selection.